Lending credence to speculation of a coming iPhone "supercycle," market research firm comScore on Thursday released data showing tens of millions of users who own legacy iPhones are primed to upgrade. According to statistics published in comScore's 2017 U.S. Cross-Platform Future in Focus report, Apple's latest iPhone 7 and 7 Plus accounted for 15 percent of the estimated 85.8 million U.S. iPhones — an all time record — in operation as of December. As with any new hardware release, previous-generation models expectedly account for the lion's share of units in circulation. For a product like iPhone, however, that translates to many tens of millions of units. 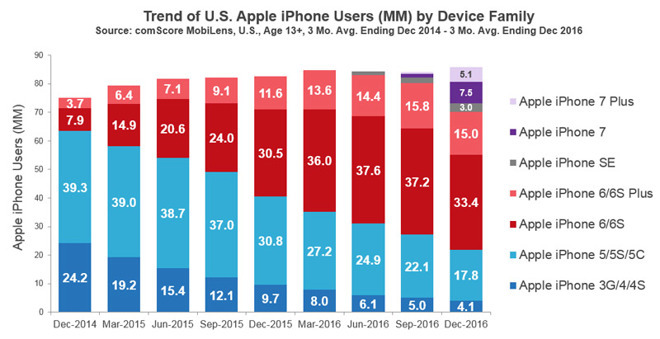 Specifically, some 48.4 million people were using iPhone 6 series devices at the end of 2016. Another 21.9 million owned an iPhone 5s or older during the same period, according to comScore MobiLens data. If historical upgrade trends continue, a healthy portion of the collective 70 million iPhone users will buy Apple's latest and greatest device, representing a huge windfall for the company. As presented in the graph above, iPhone ownership tends to surge in the fall quarter when new models are released and older versions are afforded price drops. Apple helped upend its own smartphone sales model when it introduced a phablet device in the iPhone 6 Plus in 2014, creating an even larger iPhone user demographic that swelled to 53 million combined iPhone 6 series owners in September 2016. Though iPhone 6 marketshare is slowly decaying, especially as existing users update to iPhone 7, there remains a strong contingent who have held on to older hardware. Along with new converts, owners of legacy iPhones are widely expected to fuel a so-called "supercycle" when Apple releases its next-generation handsets this fall. Coined by industry analysts, the coming "supercycle" is best described as a sudden upwelling of demand following a comparatively weak fiscal 2016. Apple last year faced three straight quarters of revenue declines as iPhone faced stiff competition and lower than anticipated sales in China. The company managed to stabilize the downturn with iPhone 7 and last quarter demolished Wall Street expectations to set a new quarterly record of $78.4 billion in revenue on the back of 78.3 million iPhone sales. For the coming iPhone upgrade cycle Apple is widely rumored to introduce not only updated iPhone 7 series hardware, but a completely new device some have dubbed "iPhone 8." Thought to be priced above "iPhone 7s" handsets, the forthcoming "Jesus phone" is expected to feature a number of exotic technologies including a large OLED display, curved glass sandwich design, dual rear-facing camera array with potential AR applications, 3D sensing front-facing camera, in-screen Touch ID and more.